The local commercial roofing solution for Acworth, GA businesses. Looking For Commercial Roofing In Acworth, GA? Mancilla Roofing & Construction is proud to offer commercial roofing services to businesses in the greater Acworth, GA area. As a roofing service provider with over a decade of experience in the industry, we understand that the long-term performance of your roof depends upon meeting the unique requirements of each individual roofing project. Our skilled technicians have the experience needed to ensure that your roofing system stands the test of time. From your initial consultation with our experts to a highly customized roofing solution for your establishment – our team will provide you with unparalleled roofing expertise and excellent customer service. As a provider of high-quality roofing solutions to businesses in Acworth GA, Mancilla Roofing & Construction can take your project from concept to completion. 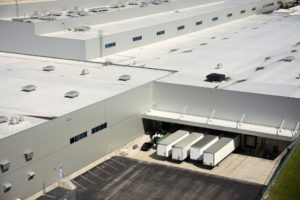 Call one of our expert commercial roofing technicians for all your roofing needs in Acworth GA.
We work with several different types of commercial roofing materials. Every roof is different, and there’s is simple no one size fits all approach. Consequently, we take the time to determine all the requirements unique requirements of your project. We then take this information into account when determining which type of roofing materiel is best for the project. Modified bitumen is one of the best materials for low-slope roof systems. The material is extremely tear-resistant – which is one of the important advantages of it. The combination of polymer reinforcement and fiberglass layers has made the material difficult to tear. On the other hand, bitumen is inherently waterproof. The material is energy-efficient compared to most of the other roofing materials on the market. 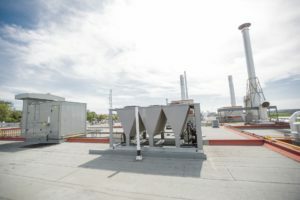 Metal is another common material for commercial roof systems. The durability, eco-friendliness, and energy-efficiency are some of the advantages of metal roofs. This is a monolithic membrane applied to commercial roofs as reinforced or non-reinforced systems. TPO or Thermoplastic roofing systems are some of the fastest growing commercial roof systems out there. It is made from highly durable material with a high temperature tolerance and low temperature flexibility. Hence, these roofs are resistant to ozone, ultraviolet rays, and chemicals. TPO roofs can easily last for more than 20 years with the right kind of maintenance. These roofs are also resistant to fires, winds, and punctures. EPDM roofing systems come with superior durability and versatility compared to other types of roofs. They are easy to install, repair, and maintain over time. That is why EPDM commercial roof systems are quite popular in Acworth GA right now. 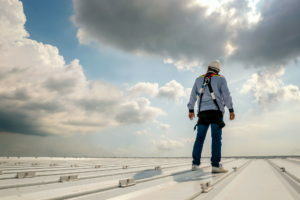 Mancilla Roofing & Construction is an expert in all types of commercial roof systems in Acworth GA. We cater to all your roofing needs from roof repair, replacement, maintenance to roof waterproofing services in the region. When you need the services of experienced roofers in GA, there is no better service provider than Mancilla Roofing & Construction. Our expert roofing technicians are prepared to go that extra mile to guarantee the satisfaction of our clients. When you need commercial roofing services in Acworth GA, you should always rely on Mancilla Roofing & Construction.